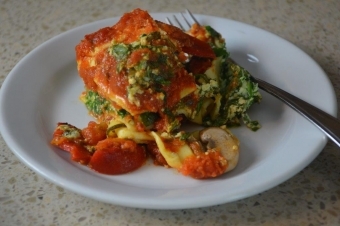 This Vegetarian Lasagna is a refreshing twist on a family favourite. With guests arriving for the holidays, often there are dietary requests made. This vegetarian lasagna made with two of Upper Canada cheeses is sure to please their palette. It’s a hearty addition to the Thanksgiving feast and can be made a couple days ahead so that the flavours of the vegetables and artisan cheese have time to combine into a mouthwatering sensation. At Upper Canada Cheese Company we are in the middle of developing a prototype of our artisan mozzarella cheese and thought it would be a great opportunity to give it a try! Don’t fret, it will be available soon to everyone at our retail outlet in Jordan. For now, you can substitute your current favourite Mozzarella cheese in this recipe. Mix Ricotta, spinach and eggs together in a separate bowl. Layer 3 lasagna noodles, 1/3 remaining sauce, 1/3 Ricotta mixture, 1/3 sliced zucchini, 1/3 sliced mushrooms, 1/3 Mozzarella and 1/3 Parmesan. Build 3 layers with remaining ingredients.Bake in oven at 350 degrees F for 45 minutes. Let cool, slice and enjoy!